Not only is polluted stormwater runoff one of the largest sources of water pollution in North Carolina, but it’s also the top cause of swim advisories and beach closures nationwide. Ocean Friendly Gardens (OFG) can be a great solution to reduce local impacts of runoff, and both the Cape Fear Chapter and the nearby University of North Carolina Wilmington Surfrider Club have successfully applied their OFG programs to address the water quality problems caused by stormwater runoff. In 2018, the Surfrider Foundation Cape Fear Chapter completed two OFG projects that engaged local youth and students in creating solutions for stormwater runoff. 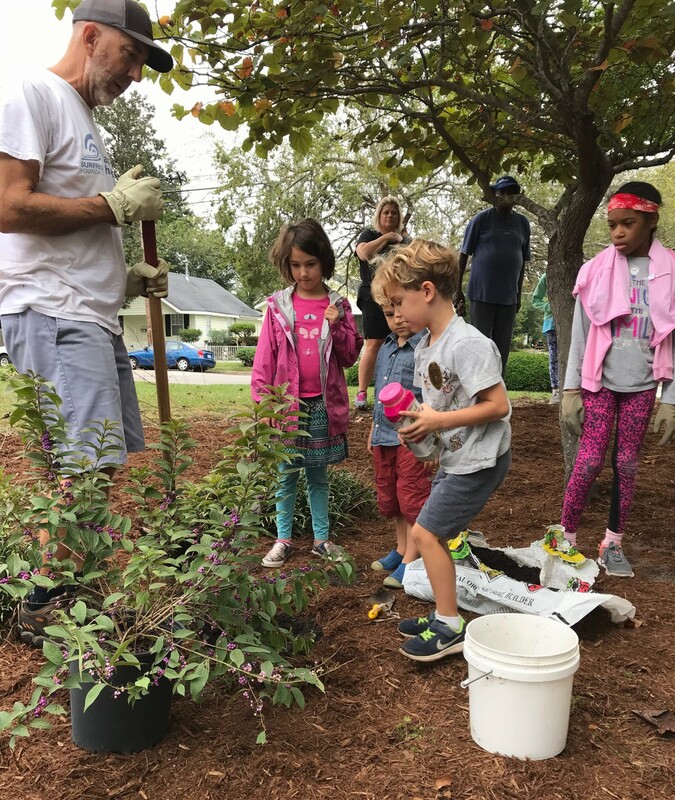 The chapter first rehabilitated an existing rain garden that captures runoff from a 20,000 square foot parking lot at Gregory Elementary, a Title I magnet school in Wilmington. With the help of local runoff capture experts, Rain Storm Solutions, the Gregory Elementary PTA, and a group of 20 volunteers, the garden was revived in just one day! This was achieved by removing the compacted soil and debris from the garden and creating a spillway with impermeable fabric and river rocks. The volunteers then mulched and pruned the existing trees and planted new native plants. The Gregory Elementary OFG is now a beautiful example of how gardens can be maintained to capture and soak up rainwater and prevent stormwater runoff from occurring. Over on the UNC Wilmington campus, Surfrider student club leader Miles Abernathy galvanized an amazing crew of Surfrider volunteers, Eco Club members and UNC faculty from the Sustainability Committee to install a large Ocean Friendly Garden. This OFG captures runoff from a newly renovated parking lot that added over half an acre of impervious surface to the campus. Runoff from the parking area is now directed into this new OFG, where it can soak into the ground instead of running straight into the already-impaired Bradley Creek that flows across campus. Check out this beautiful video documenting the installation of the garden on campus last spring. Ocean Friendly Rain Garden from Willow Rea on Vimeo. This year, the UNC Wilmington Surfrider Club and the Cape Fear Chapter will continue their efforts to protect clean water. At the university level, the student club will host more work days, develop signage and expand outreach opportunities on campus. The Cape Fear Chapter will be partnering with the City of Wilmington Heal our Waterways program to hold a rain garden workshop, transform a residential yard and install an OFG in a public space. The chapter is working to secure locations that will further help improve water quality in Bradley Creek. In addition to working within the same watershed, another special connection between the two Surfrider OFG groups in North Carolina is that the Cape Fear OFG Coordinator, Abby Perry, first motivated club leader Miles Abernathy to get involved with the Surfrider Foundation as his faculty club advisor at Cape Fear Community College. It is inspiring to see Abby’s influence blossom as former students grow into conservation leaders that are ready to tackle pollution problems at the coast.